Police yesterday said they will be on high alert today during the MDC-Alliance planned demonstration following indications that some rogue elements within the party were planning to cause mayhem and anarchy in and around the city. This also comes after Government recently said MDC-Alliance and its leadership will be held accountable if their planned demonstration resulted in loss of life, limb or damage to property. 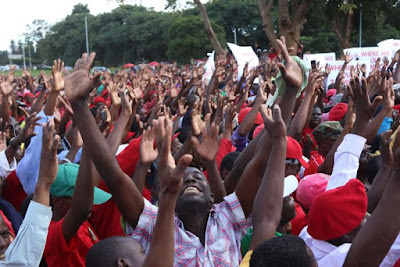 MDC-Alliance leader Mr Nelson Chamisa, who last week branded as “stupid” demonstrators who took part in the August 1 demonstrations which left six people dead and damaged property, said his party will march against the Government. In a statement yesterday, chief police spokesperson Senior Assistant Commissioner Charity Charamba said those who cause violence will be dealt with according to the law. She said the regulating authority, the ZRP, had sanctioned the planned demonstration. “Intelligence at hand indicates that some elements are planning to cause violence, disrupt the smooth flow and the peaceful environment in Harare’s Central Business District,” said Snr Asst Comm Charamba. “The Zimbabwe Republic Police is on high alert monitoring the situation to ensure all those who will cause violence are dealt with according to the law. Snr Asst Comm Charamba said the conveners of the demonstration would be held accountable for any disruptions, destruction of property and ensuing violence in the CBD. It recently emerged that the planned protests had nothing to do with economic issues, but were meant to pressure President Mnangagwa and Zanu-PF to share power with Mr Chamisa and his party. Mr Chamisa told London-based international news magazine, The Guardian Weekly, last week that the protests would call for a “transitional authority” to “move the country forward”. Deputy Chief Secretary to the President and Cabinet (Presidential Communications), who is also the Presidential spokesperson, Mr George Charamba, this week said the onus was on the opposition political outfit to ensure there was no injury to life or damage to property. Mr Charamba said certain protected areas will be a no-go area for the opposition supporters.